Anyone who has ever seen the rolling hills of Germany’s western Eifel region knows that the area is perfect for cycling. And, one day, it might not just be the hills that are green, but also the path you are cycling on. 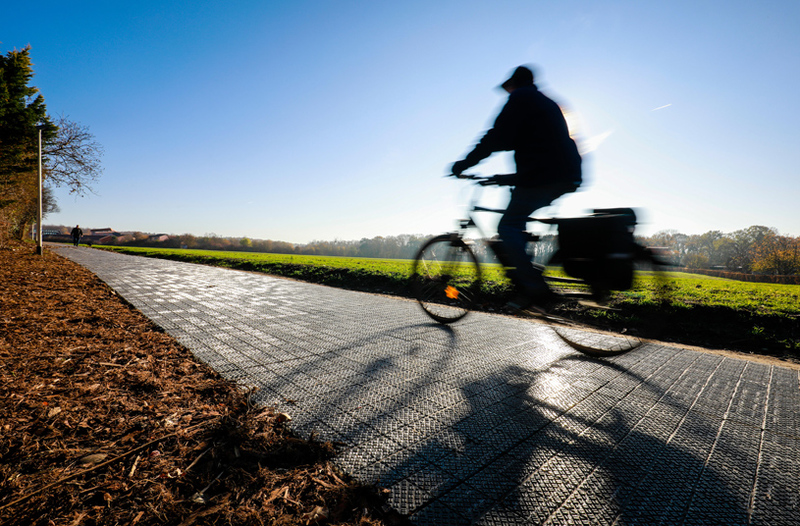 The 90-meter test track is made up of 150 solar modules that cover an area of 200 sqm and are covered by slip- and fracture-resistant glass tiles with a profile allowing bike tires to keep their grip. The stretch of modules can generate up to 16 MW hours of electricity each year, or enough for about four single-family homes. What’s more, the track is illuminated by built-in LED lights and can heat itself in the winter to melt snow and increase safety. The path was developed by Solmove in collaboration with three research institutes and two universities. The Potsdam-based startup develops robust, sound-absorbing glass-covered photovoltaics that can be glued to horizontal surfaces, such as parking lots, driveways and side streets.